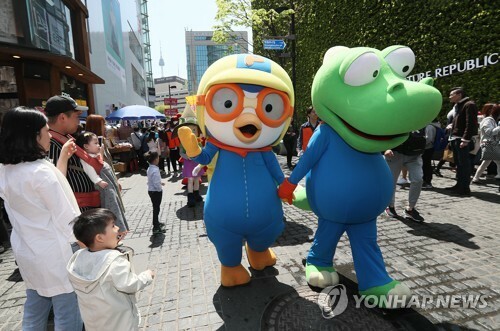 SEOUL, May 8 (Yonhap) — OCON Inc., the animation studio that created the computer-animated TV series “Pororo the Little Penguin,” plans to launch an initial public offering (IPO) next year, company officials said Monday. First aired in 2005, Pororo is one of the most popular cartoon characters for children in South Korea. OCON holds a 27 percent stake in the copyright of the TV series, with another studio, Iconix Entertainment, holding another 27 percent. The remaining 46 percent is equally owned by SK Broadband and broadcaster EBS. OCON has signed a contract to name Mirae Asset Daewoo as its sale adviser for the offering. The timing of the IPO will be in the second half of next year, both OCON and Mirae Asset Daewoo officials said. Set up in 1996, OCON posted an operating profit of about 4 billion won (US$3.5 million) on sales of 13.3 billion won in 2016.